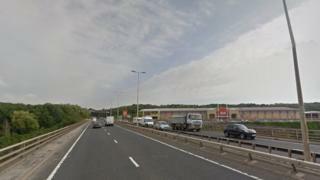 A third lane will be added to a five-mile stretch of the A1 in Newcastle, Highways England has announced. Work on the road north of the Tyne between Scotswood and North Brunton is expected to start by March 2020. A similar £61m upgrade to four miles of the A1 south of the river around Gateshead was completed in July 2016 and took two years. Highways England said the new lanes would "cut congestion" and cost between £140m and £180m. Highways England is also working on plans for an upgrade between Birtley and the already completed section starting at Coal House and running to the MetroCentre.